Möllner Museum | Till Eulenspiegel - jester or yeoman? Till Eulenspiegel - jester or yeoman? The little town of Mölln is well known for the beautiful rural landscape and the medieval character of the old part of the town. Mölln is one of the oldest towns in the county of Schleswig – Holstein, founded in the 12th century, when Christianization had established in the eastern parts of Northern Germany. The St. Nicolai – church, dated from the early 12th century, shows a lot of details of beautiful artwork – woodcarvings, glass windows, the organ, paintings, brass chandeliers and other fine examples of North German artwork from 1500 to 1800. Outside, in a niche on the left side near to the church tower, the memorial of Till Eulenspiegel can be seen. It is a column of sandstone, originally used for a portrait of Maria with the young Jesus. About 1530, a picture of Till Eulenspiegel was engraved on the former backside. The column was put on the churchyard near to the St. Nikolai church. 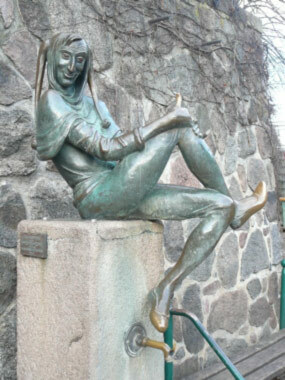 Since the 16th century, many travellers from abroad have seen and described the “tombstone” of Till Eulenspiegel (as it is often called). 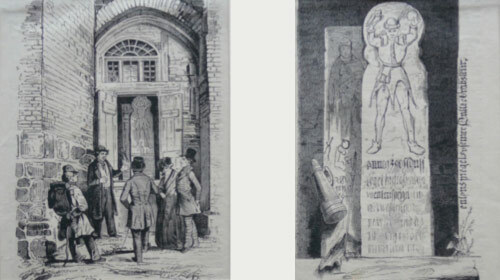 In former times, memorials like a sword, a coat of mail and iron spectacles were presented as relics from Till Eulenspiegel`s life (can still be seen in the Eulenspiegel Museum on the market place). 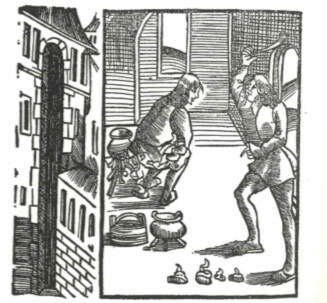 An unknown author wrote the book of Till Eulenspiegel, containing 96 stories of his life and travel through Germany and other European cities (e.g. Prague, Rom and Copenhagen). The book begins with the birth of Till in the year of 1300 in a small village in Lower Saxony and it ends with his last voyage to Mölln, where he died in 1350. It was a period, when the plague was spread all over Europe; whole regions suffered from the fact that thousands of people had died; leaving huge areas without any survivors. Was Till a victim of the plague too? To say the whole truth: We don´t know whether Till had really lived (and died…) in Mölln. A lot of questions are related to the figure of Till, the person of the author and even the time, when the book was first published. The first print dates from 1510/11 and was published by the printer Johannes Grünninger, a well known publisher working in Straßbourg / France. Maybe an author from Lower Saxony had collected older stories from older books and material from folklore tales. His name is Hermann Bote, a toll clerk from Braunschweig, who is supposed to be the “father” of the literal character of Till Eulenspiegel. Till Eulenspiegel is a jester, sometimes behaving like a fool – but in fact he isn´t one. In the great tradition of the European motive of foolish acting characters, Till Eulenspiegel is the type of a wise fool, who is only playing the role of a stupid, mentally retarded guy. 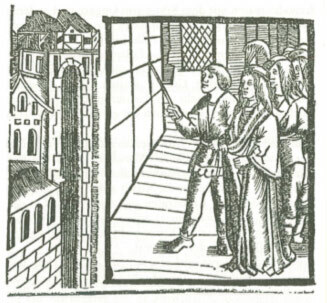 In 96 chapters, called (“Historien”), illustrated with woodcuts we can read about Till´s life and his pranks. His surname (“Owlglass”) reflects the intention of the unknown author: “Eule / owl” is related with wisdom, (“Spiegel / mirror”) is meant as an instrument of reflecting yourself. Most pictures of the Eulenspiegel-figure show these two attributes and the costume with the characteristic formed cap of a fool (see the German tradition of carnival feasts in Cologne or Düsseldorf or rites on the Fasnacht – plays in south Germany). Eulenspiegel´s outlook can be interpreted as an instrument of camouflage, he only wears the sign of a stupid person, but he isn´t really one. The two lappets of the cap are sometimes related with the shape of the head and ears of a donkey, expressing the typical behavior of this animal. Parts of his dress are described as “out -of – time – clothing” of a former nobleman. Till´s book a report of social conflicts? Interpretations say that Till Eulenspiegel´s stories reflect the social transformation in many German regions in the beginning of the 16th century. The new philosophical ideas of Humanism came from Italy to the North – ending up with medieval philosophical and religious structures. In many German towns the class of the craftsmen struggled for their participation in the local government, bloody riots happened in many towns. In 1517 Martin Luther published his 95 theses – and initiated the most important changes in the social and political life in Germany for the next 150 years. Why became the book of Eulenspiegel and his tradition in German folklore so important? In his book, Till is travelling through the towns and villages in the German Reich in the middle of the 14th century. People enjoyed the stories of Till; historical reports from the Frankfurt book fair give hints that this book was regularly ordered in huge numbers (and therefore was prohibited by the Catholic church for a long period). The function of most of the stories is very similar: On his journey, Till is getting in contact with people of all status groups very easily – and in (t)his further process of communication, Till often tries to act by taking people by their own word. Till tries to work for different craftsmen; always with the same result: Till is constantly engaged by misinterpreting the sense of the spoken. The simple means of using double – meaning gives the effect for the function of the Eulenspiegel – book and made it famous in Germany for at least 500 years. Some stories of Till Eulenspiegel (called “Historien”). 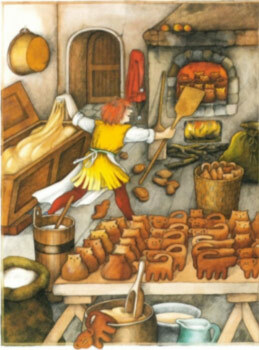 In Braunschweig he wants to work as a baker; before starting his work, he asks the baker, what he shall bake during the night. Hearing this stupid question, the baker gets angry and tells Till to bake “owls and monkeys” – in the morning he has to state the result. There is a wonderful smell of fresh baked bread all in the house, but on the shelves and in the baskets there are only figures of these two kinds of animals. Seeing Till selling these figures (after the baker has thrown Till out of his house) makes him upset again for a second time this morning. Sometimes Till even uses his excrements to take revenge (esp. to priests!) or to earn money by selling barrels full of this stuff to some shoemakers who ordered fat for the use as shoe polish. At the court of a duke´s castle Till pretended to be a famous painter. He was encouraged to paint the ancestral portrait gallery. Till invited several friends, ordered wine, beer and fine foods, but did not allow anyone else to enter the room within the next weeks. When the duke and his court demanded the entrance after some weeks, Till and his companions didn´t have finished any paintings. The walls were only rough prepared with white chalk paint, but Till told the duke, that only people born in wedlock were able to see the new impressive paintings. The Duke and court stared at the empty walls, felt ashamed (they didn´t see anything…), but no one protested. On the contrary, all praised the colorful paintings and the style of the portraits! He even hoaxed the people of Mölln for several times. When he felt his death coming, he promised in his testament that he would give all his accumulated wealth to the church, the major and the people of Mölln if they would celebrate a worthy funeral for him. Till told them that Mölln should become “stein –reich” (that means very rich by using the prefix “stone”). It was the first statue of the Mölln artist Karlheinz Goedtke (1915 – 1985), modeled in 1950 and known all over Germany. Famous German authors like Erich Kästner, Gerhard and Christa Wolf, Gerhard Hauptmann and Bertolt Brecht have written their own Eulenspiegel books for younger and older readers. Read more: Oppenheimer, Paul, tr. Till Eulenspiegel: His Adventures. London: Routledge, 2001.